Advice: how to export for GIS map? I am looking for advice/assistance. I am currently building an archive of correspondences (XIX century) and would like to map certain items with GIS: what is the simplest way to export metadata in order to obtain a CSV or XLS file? After browsing the threads about this issue (particularly the “exporting as CSV file” one), I am not sure of the solution: is there any other option besides Omeka S or JSON? An easier solution would be much appreciated by my inability to play around with HTML coding. I feel like there are some misunderstandings around the default JSON-LD export: it definitely looks complicated, but this is owing to the fact that Tropy’s metadata model is rather complicated, because of the underlying customisability. For example, in CSV you typically have one row per ‘item’ and you have a set of clearly defined columns (title, date, etc.). 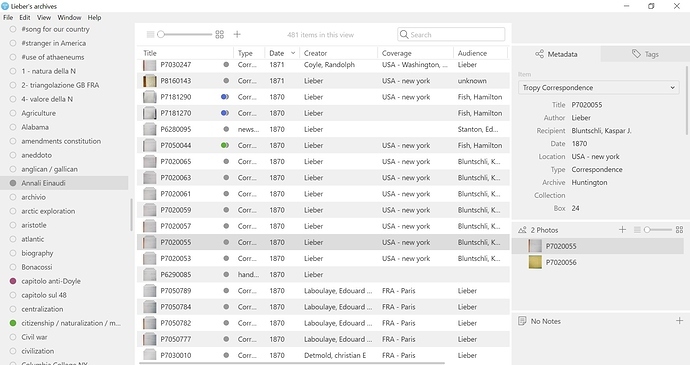 Not only does Tropy have different levels of metadata (item, photo, selection) but there is not a single ‘column’ that is guaranteed to exist. For these reasons it would be very difficult to ‘just export to CSV’ in general. That said, it is typically very easy to do so for a specific case, that is, given some knowledge how you organize items and photos (one-to-one vs one-to-many). Therefore, the best answer to your question how to export to CSV, currently, is via an CSV export plugin specialized to your data model. I’m happy to set up such a plugin for you. 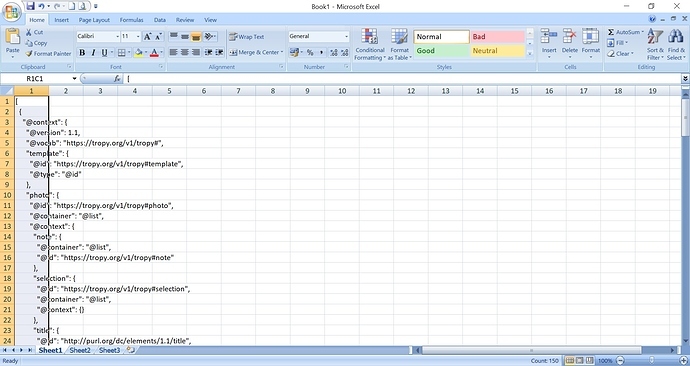 Typically the best way to get started is if you take one item (or a handful of items) and copy paste them into a text editor (just select the items in Tropy, hit Cmd/Ctrl+C and paste into an editor) and then come up with an ideal CSV version of that (i.e., you need to decide whether you want one row per item or per photo, which metadata to go into which column, and so on). If you can provide me with that information, I can set up an export plugin for you that should allow you to save/export any item to a CSV file. I see only now your nearly immediate answer, for which I thank you very much. author-audience-location-date- type. Is this possible? So you just need to export those item-level fields? This should be very easy, I’ll prepare a plugin for you to do just that. Yes exactly. As my work proceed I will analyze more deeply, but now I have only to map these correspondences. thank you then! Alright, I’ve prepared a first version of a plugin for you. 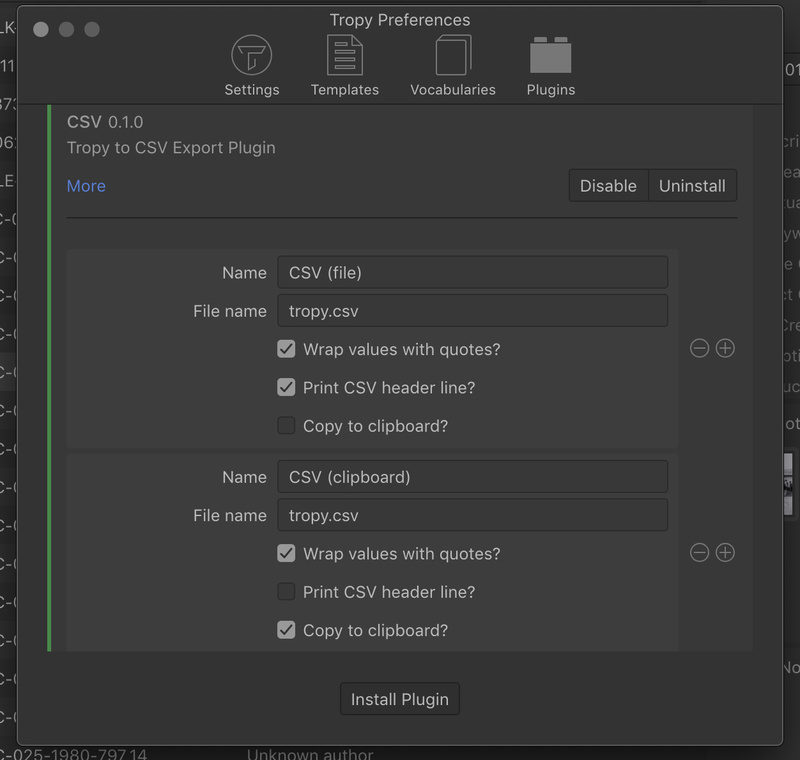 Right now this is aimed at your specific use-case, but it should be easy to adjust for others’ CSV requirements and my hope is that we’ll eventually expand this into a fully customizable CSV plugin that can handle all kinds of different setups. That said, you download the plugin here by downloading either the zip or tar.gz package of the latest version. 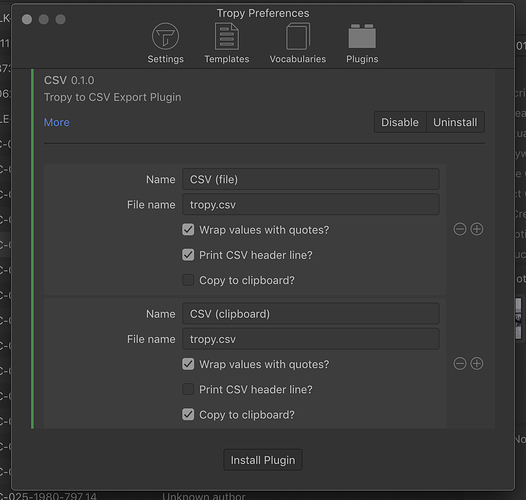 In Tropy, you can install the plugin in the plugins’ pane of the preferences window. Once installed, you need to activate the plugin and add a configuration. In the screenshot above I’ve created two different configurations which I’ve called CSV (file) and CSV (clipboard). The configuration options right now are rather limited, but should be easy to understand. You can set a default file name and decide if you want to wrap each value in quotes or include a header row. 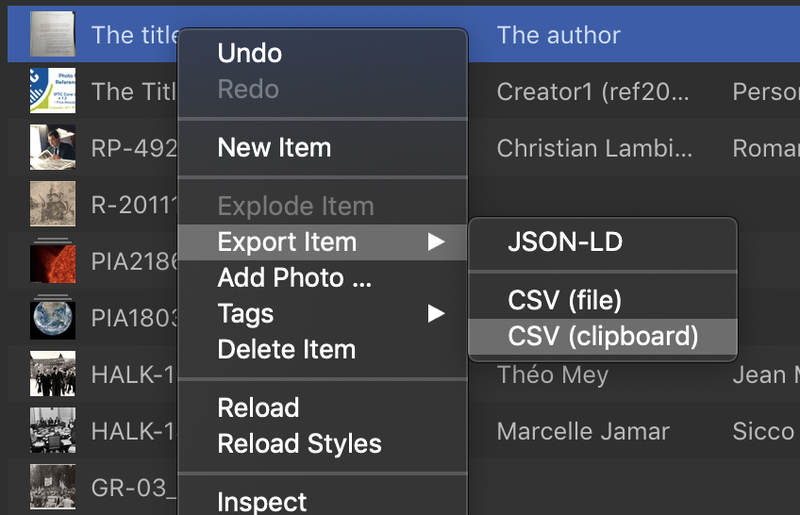 Additionally, you can use the clipboard option to export directly to the clipboard instead of saving a file. At the moment, the plugin assumes that you’re using the correspondence template (and the English version of Tropy) and will pick the author, recipient, date, location, and type of your items. In the future I would like to allow you to make the selection of fields to pick directly in the plugin’s configuration, but the plugin preferences pane is currently not good enough for this. (You can still change the fields by editing the plugin file directly). Right, I hope this is a good start. Let me know if it works for you! Thank you Inukshuk, I am very grateful for your work! I just installed it (no issues) and tried with a bunch of data: everything works totally fine and the CSV looks great. Of course I will be happy to provide any feedback you might need to make the plugin useful to other users.